Posted on April 2, 2014 | Comments Off on What’s a Cruet? My favorite salad dressings are vinaigrettes. They can be as simple as olive oil, vinegar, salt and pepper. The problem with most commercial vinaigrettes is the label says “_____ Vinaigrette with olive oil,” but the first listed ingredient is soybean oil (or some other industrial seed oil) and olive oil is somewhere down the line. My current favorite commercial salad dressing has water as the first ingredient! You can make a vinaigrette in a jar with a lid. Add the ingredients then shake to create an emulsion. Or do it in a bowl with a whisk. My wife found us a cruet at the supermarket that I was hoping would allow mixing, storing, and pouring all from the same attractive container. Unfortunately, it leaks when I shake it. Comments Off on What’s a Cruet? This huge salad is a full meal. It fills a 10-inch plate (25 cm). Since it contains five vegetables, you should feel virtuous eating it. Who says the paleo diet’s all about meat? First cook the chicken breast over medium heat in a skillet. If you think the meat will stick to the pan, add a smidgen (1/2 tsp or 2.5 ml) of olive oil to the pan. Don’t overcook or the meat will get tough. It’ll take five or 10 minutes. While that’s cooking, prepare your vinaigrette. In a jar with a lid, place the olive oil, vinegar, salt, pepper, and rosemary, then shake vigorously for 20 seconds. Not 21 or you’ll ruin it. You’re done. 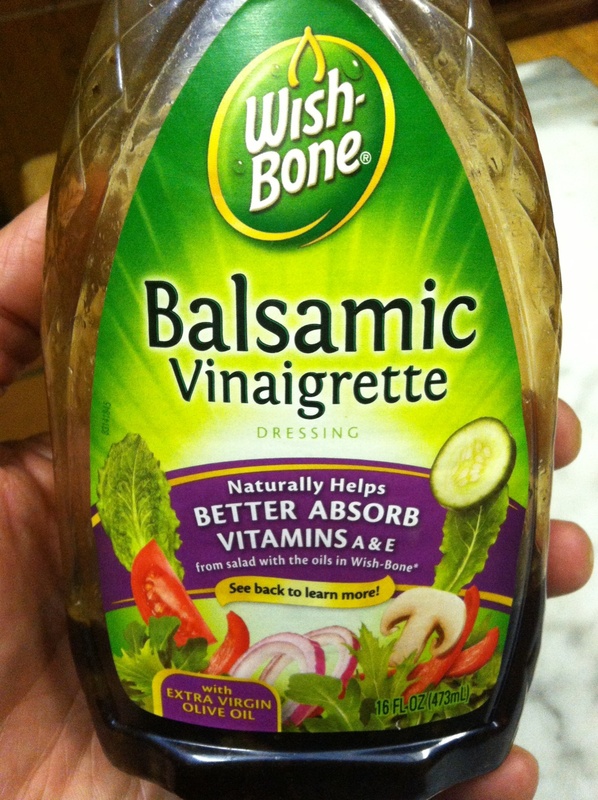 If you use a commercial vinaigrette instead, use one that has no more than 2 g of carbohydrate per 2 tbsp. You may have trouble finding that since so many of the commercial guys add sugar. 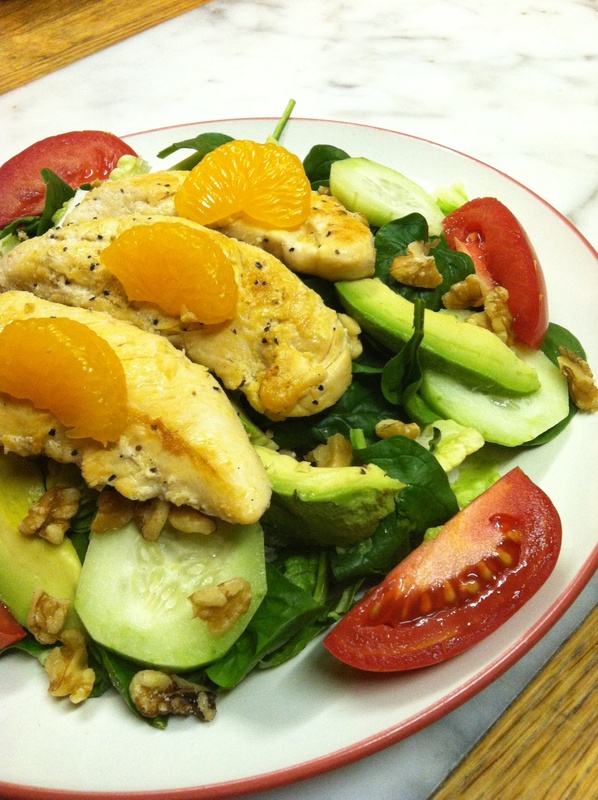 Place the lettuce and spinach on a plate then add the cucumber, avocado, tomato, cooked chicken, walnuts, and mandarin orange wedges on top. Drizzle two or three tbsp of the vinaigrette over it (nutritional analysis assumes three). Enjoy. Prominent features: Rich in protein, vitamin A, B6, C, copper, iron, manganese, magnesium, pantothenic acid, selenium, and phosphorus. I like this and use it. The lower left corner says “with EXTRA VIRGIN OLIVE OIL.” In order, the listed ingredients are water, balsamic vinegar, soybean oil and extra virgin olive oil, sugar…. 2 tbsp has 3 grams of carb. Which oil would you guess predominates? BTW, balsamic has the most carbs of all the vinegars. This is what I did with some of our leftover Thanksgiving turkey. If you don’t have leftover turkey, I bet leftover chicken or steak would be fine substitutes. Heck, I’m tempted to try it with salmon or canned tuna or chicken. 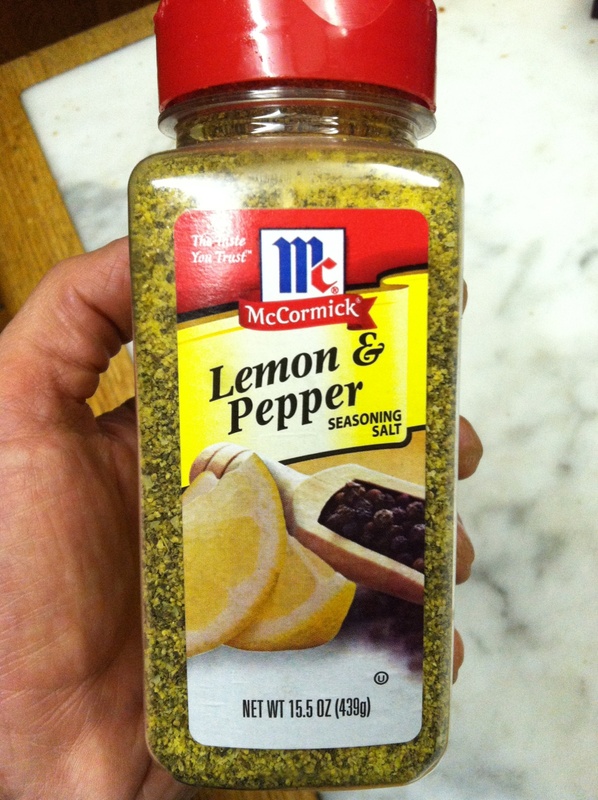 In addition to the flavor, what I like about this meal is that it’s crazy quick. 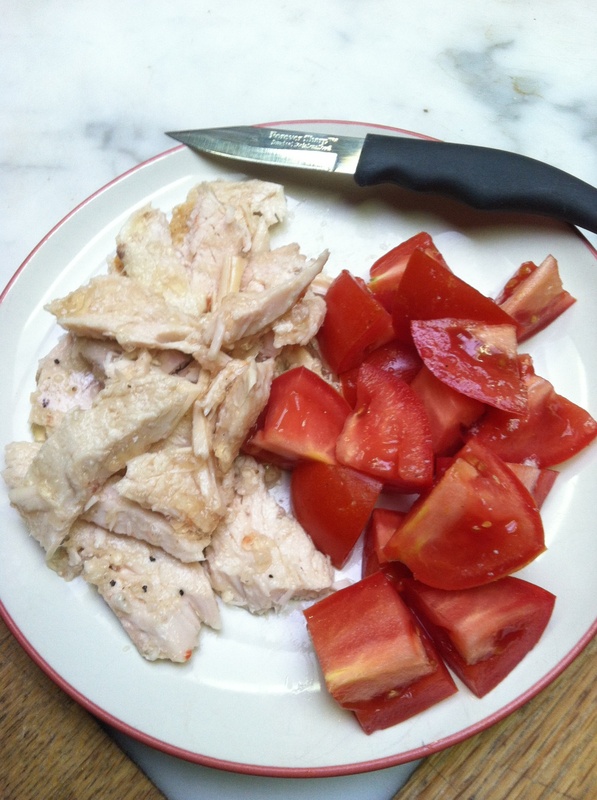 These roma tomatoes were amazingly flavorful for late Fall in the northern hemisphere. Before cooking, my wife injected the bird with olive oil, massaged periodically over 30 minutes, then popped it in the oven. 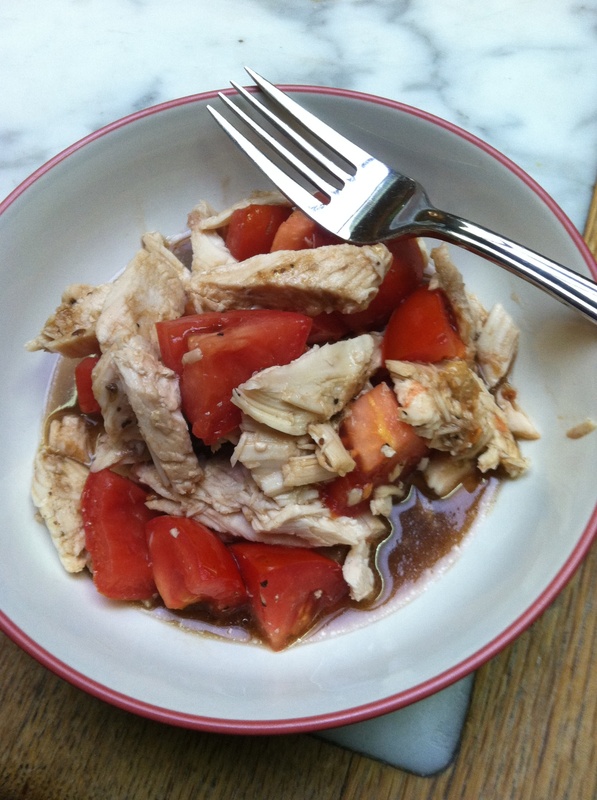 Toss the turkey and tomato chunks in a bowl, splash on the vinaigrette, then microwave for 60-80 seconds. Pepper as desired. Drink the leftover juice right out of the bowl. Enjoy with macadamia nuts for dessert and you’ve got a full meal. I don’t know any home cooks who add water to vinaigrettes. They are essentially oil and vinegar (in a ratio of 3:1) and spices. The ones I make have quite a bit more than 60 calories per two tbsp (30 ml); more like 220 cals. All of the oils you would use have about 120 calories per tbsp all from fat. 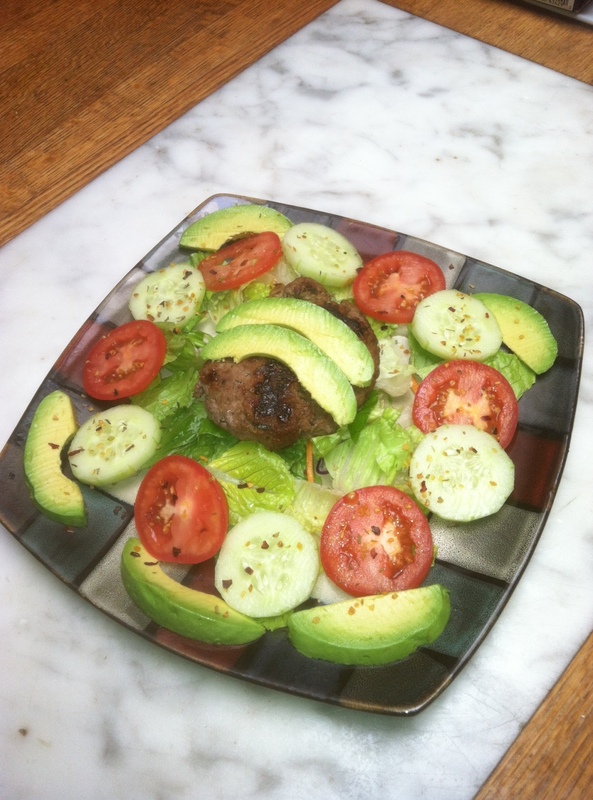 If you make this recipe with home-made vinaigrette, add 150 calories to the nutritional analysis below. It won’t affect the carb count. Note that of the common vinegars, balsamic has the most carbohydrates—some vinegars have zero. 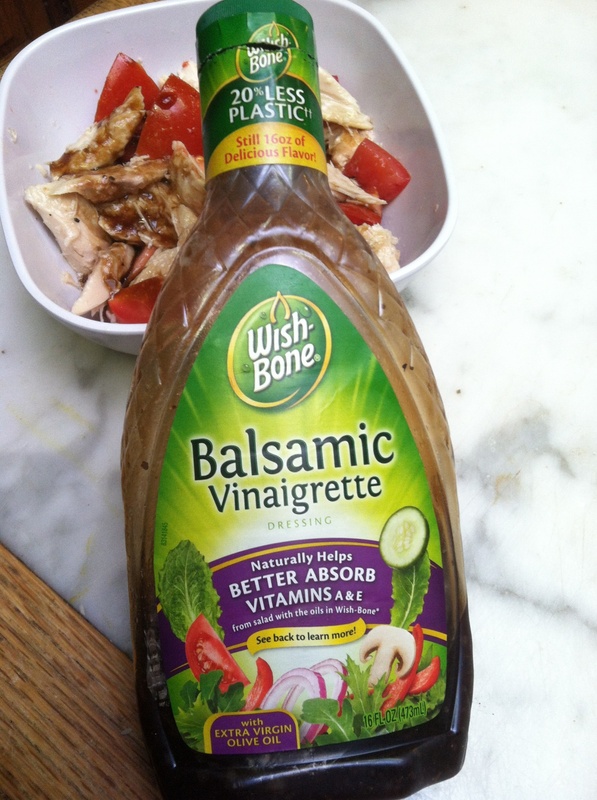 If you use typical amounts of balsamic vinaigrette, you shouldn’t need to worry about the carbohydrates unless perhaps you’re on a strict ketogenic diet and limited to 20-30 grams of carb daily. Prominent features: High in protein, vitamin B6, iron, manganese, niacin, phosphorus, selenium, and zinc. Bonus pic! 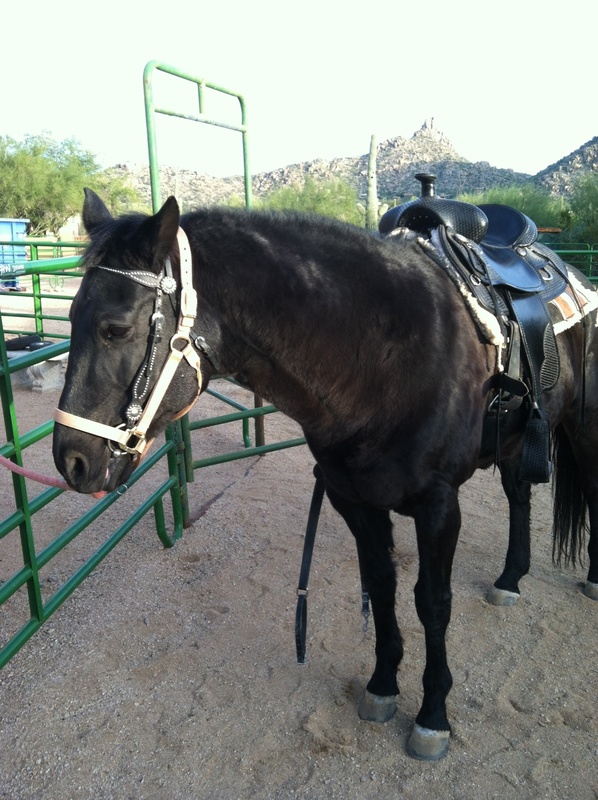 A new horse at the Parker Compound. He’s an old-style Morgan. This was an OK dinner. My wife didn’t care for it, which may explain why don’t see anything similar on typical restaurant menus. You see salads with chicken, salmon, or steak strips, usually. Hamburger’s just not an ideal pairing with the other flavors, I guess. I dressed it with the left-over olive oil vinaigrette I made yesterday. My wife whipped this up for a quick lunch. 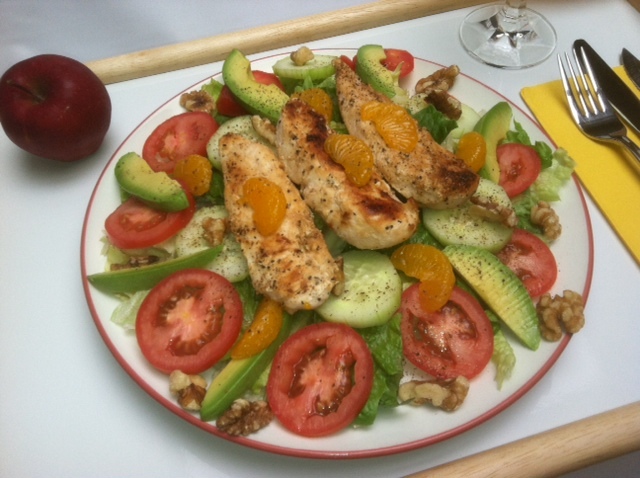 The salad has several types of lettuce, walnuts, mandarin oranges, avocado, cucumber, and tomato, topped with pan-fried skinless chicken strips. I made the vinaigrette with extra virgin olive oil, balsamic vinegar, and salt/pepper in about two minutes. My oil to vinegar ratio was 3:1. My wife wants less vinegar next time. Sprinkle on Weber Roasted Garlic and Herb Seasoning for extra zing, if desired. I may add this to my next batch of vinaigrette.